A Russian Soyuz TMA-17M rocket launches three new members of the International Space Station's Expedition 44 crew on July 22, 2015 from Baikonur Cosmodrome, Kazakhstan, where the local time was early July 23. 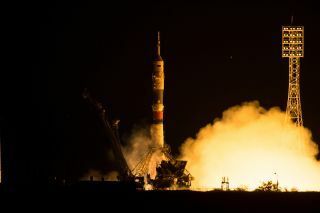 The Soyuz carried NASA astronaut Kjell Lindgren, Russian cosmonaut Oleg Kononenko and Japanese astronaut Kimiya Yui to the station to begin a five-month mission. This story was updated at 11:15 p.m. EDT. Three astronauts arrived at the International Space Station today (July 22), kicking off an orbital stay that was delayed nearly two months by an unmanned cargo-mission failure. NASA astronaut Kjell Lindgren, cosmonaut Oleg Kononenko and Kimiya Yui of Japan blasted off atop a Russian Soyuz rocket from Baikonur Cosmodrome in Kazakhstan today at 5:02 p.m. EDT (2102 GMT; 3:02 a.m. Thursday local Kazakhstan time). A Russian Soyuz spacecraft carrying NASA's Kjell Lindgren, cosmonaut Oleg Kononenko and Japan's Kimiya Yui approaches the International Space Station for docking on July 22, 2015. A new crew for the International Space Station waves farewell to friends and family before launching into space from Baikonur Cosmodrome in Kazakhstan on July 22, 2015. They are (from top): astronaut Kimiya Yui of the Japan Aerospace Exploration Agency; NASA astronaut Kjell Lindgren; and cosmonaut Oleg Kononenko. Everything continued to go smoothly in orbit; the Soyuz spacecraft carrying the trio docked on schedule at 10:45 p.m. EDT (0245 GMT), while the orbiting lab was zooming over Ecuador, NASA officials said. It's been a long road to space for the astronauts and cosmonaut who blasted off today. Lindgren, Kononenko and Yui were originally slated to launch in late May, but they were grounded for nearly two months while investigators looked into the failure of Russia's Progress 59 cargo mission. The unmanned Progress 59 spacecraft went into an uncontrolled spin shortly after its April 28 launch, and the freighter fell back to Earth a week and a half later without ever reaching the International Space Station. The mishap was apparently caused by a glitchy linkup between Progress 59 and the third stage of its rocket, Russian space officials announced last month. Progress 59 also launched atop a Soyuz rocket, so NASA, the Russian space agency and their partners wanted to make sure all was well with the booster before green-lighting the next crewed mission — hence the delay. Lindgren, Kononenko and Yui bring the International Space Station's Expedition 44 up to its full complement of six crewmembers. Already aboard the orbiting lab were NASA astronaut Scott Kelly and cosmonauts Gennady Padalka and Mikhail Kornienko, who had the place to themselves since the departure of three other crewmembers on June 11. Padalka, who has spent more time in space over his lifetime than anyone else in history (828 days and counting), is serving the traditional six-month stint. Today's launched marked the first trip to space for both Lingren and Yui. Kononenko has been to the space station twice before, on six-month missions that began in April 2008 and December 2011. On the current mission, the three men will spend about five months in space; they'll return to Earth in December.